A family vacation took us to Prince Edward Island. Not much there gaming related but we did get to walk around a couple of fortifications. Port-la-Joye (later Fort Amherst) is located just west (across the bay) from Charlottetown. French settlers arrived in 1720 and a small number of structures for were built to house a garrison and civil authorities on a hill overlooking the harbour. 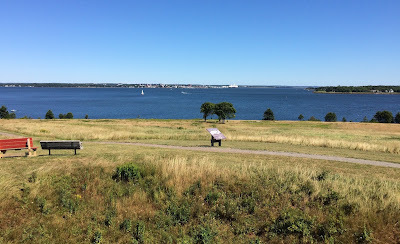 The picture above is looking east from the fort site to Charlottetown. 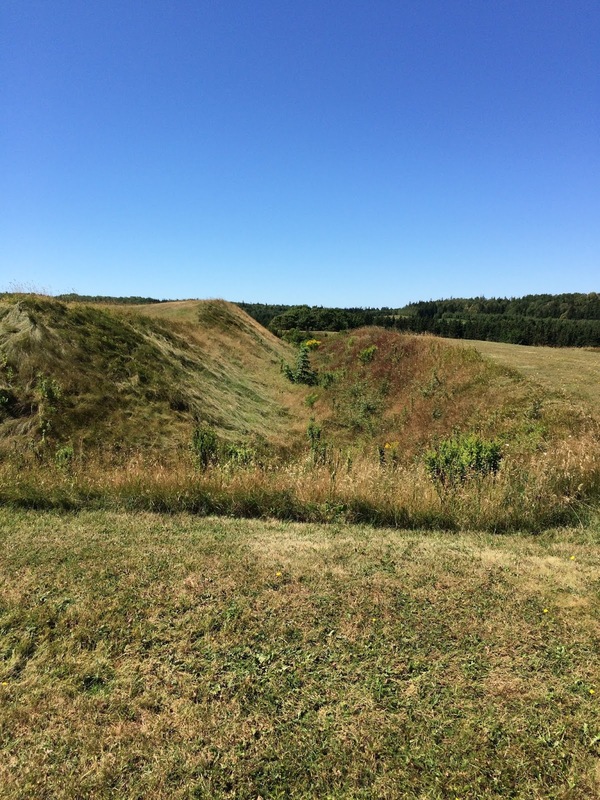 British troops took possession of the site and burned the French fort in 1745. In 1758, the British took possession of PEI and built a new fort on the same site. 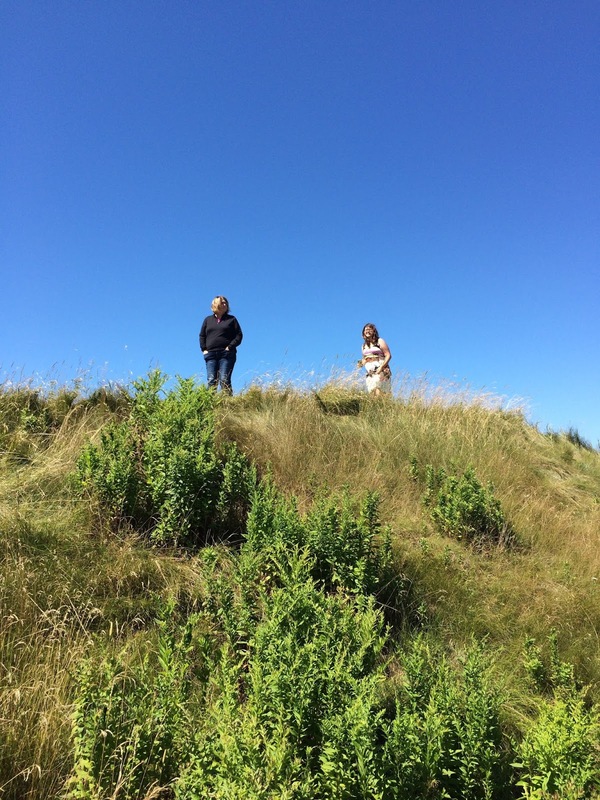 You can still see the earthworks. 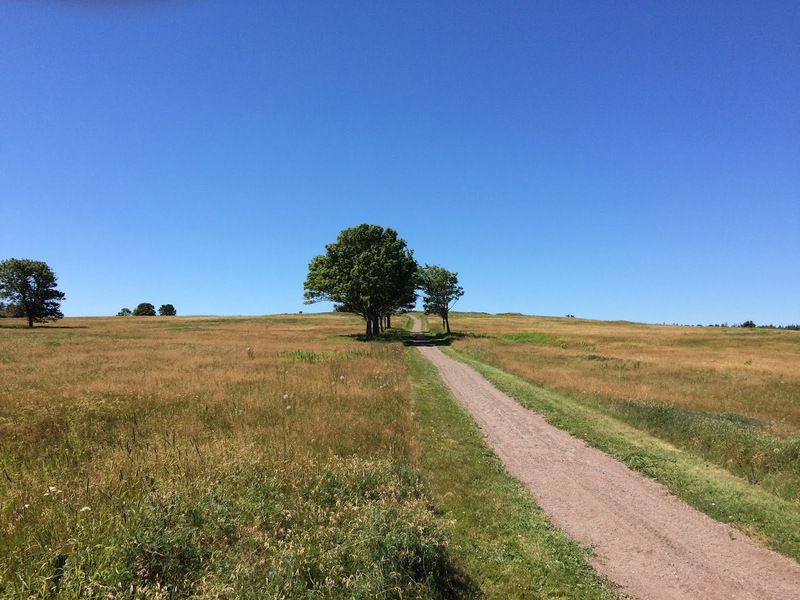 The picture below looks east towards the Fort Amherst earthwork. 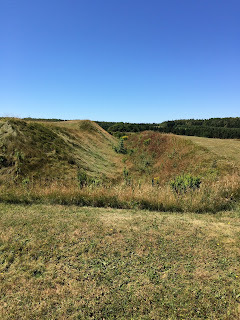 The fort site is about 100 feet by 150 feet (at a guess--I didn't pace it off) and is surrounded by an earth berm and ditch. Inside the fort (below) you can see the remains of cellars from the buildings. While the fort sounds small, walking around it gives you a different impression. The outside ditch is substantial. Below you can see me looking up to top of the berm (which presumably would have had a palisade on top of it) as well as a profile shot of the berm and ditch. The site itself commands the surrounding area. Landing would require scaling a substantial cliff and then advancing 200+ meters uphill across a large open area. The forts 18 guns would command the harbour and its entrance. There were a number of very interesting monuments discussing the Acadian deportation. 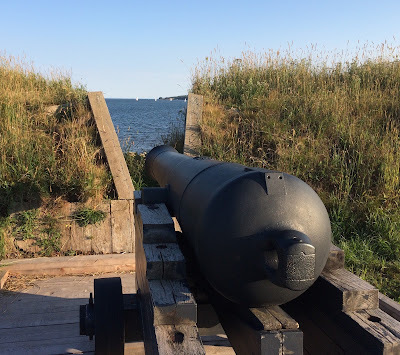 In 1768, the British moved across the bay to the site of present-day Charlottetown and eventually constructed three batteries there (salvaging the Amherst guns, which later went to Crimea). The Prince Edward battery remains today (in Victoria Park). Looking out the gun port below, you can just see the site of Fort Amherst on the right (above the sail boats). This battery covers the entrance to the bay. 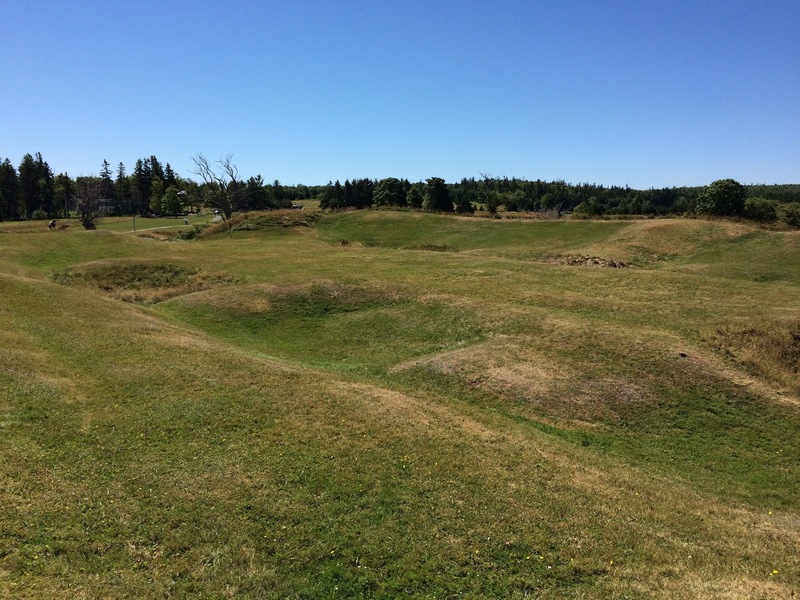 The site of George's battery now seems to hold a combination of housing and a Canadian Forces building. 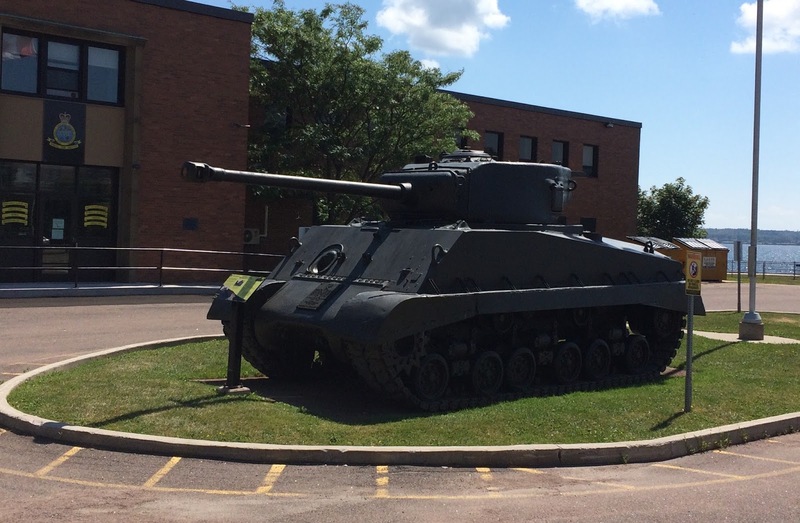 Here you can see some old vehicles (a Sherman, a Lynx, and a Ferret) and some artillery. 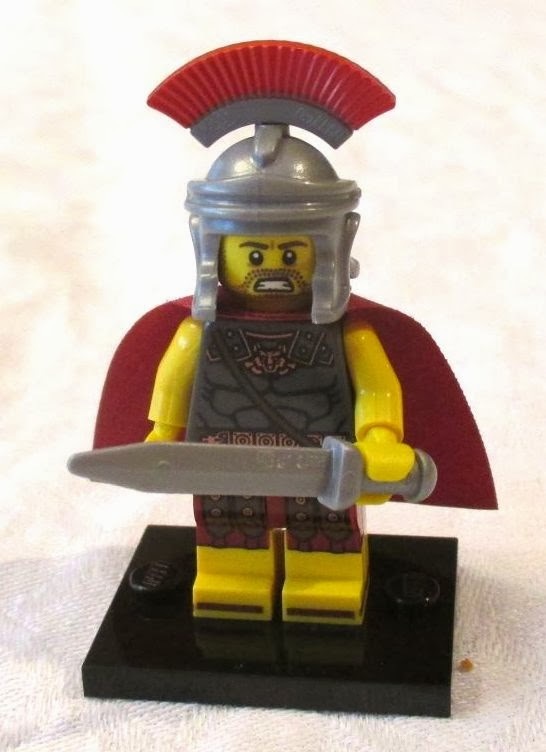 The gaming scene in Charlottetown was a bit slim. There are two comic stores (Comic Hunter and Lightening Bolt Comics and Games) in downtown Charlottetown. These have mostly CCG and CMGs, although Comic Hunter also had some board games and Warhammer. There was also a boardgame cafe that I didn't get a chance to visit. Charlottetown itself was lovely.